, a learned physician, who first discovered several of the properties of the load -stone, was born at Colchester, where his father was recorder, in 1540; and after an education at a grammarschool, was sent to Cambridge. Having studied physic for some time, he went abroad for his farther improvement; and in one of the foreign universities, had the degree conferred upon him of M. D. He returned to England with a considerable reputation for his learning in general, and had especially the character of being deeply skilled in philosophy and chemistry; and resolving to make his knowledge useful to his country by practising in this faculty, be presented himself a candidate to the college of physicians in London, and was elected a fellow of that society | about 1573. Thus, every way qualified for it, he practised in this metropolis with great success and applause; which being observed by queen Elizabeth, whose talent it was to distinguish persons of superior merit, she sent for him to court, and appointed him her physician in ordinary; and gave him, besides, an annual pension, to encourage him in his studies. In these, as much as his extensive business in his profession would permit, he applied himself chiefly to consider and examine the various properties of the load-stone; and proceeding in the experimental way, a method not much used at that time, he discovered and established several qualities of it not observed before. This occasioned much discourse; and spreading his fame into foreign countries, great expectations were raised from his treatise on that subject, which were certainly not disappointed when he printed it, in 1600, under the following title, “De Magnete, magneticisque Corporibus & de rnagno magnete Tellure, Physioiogia nova,” i.e. 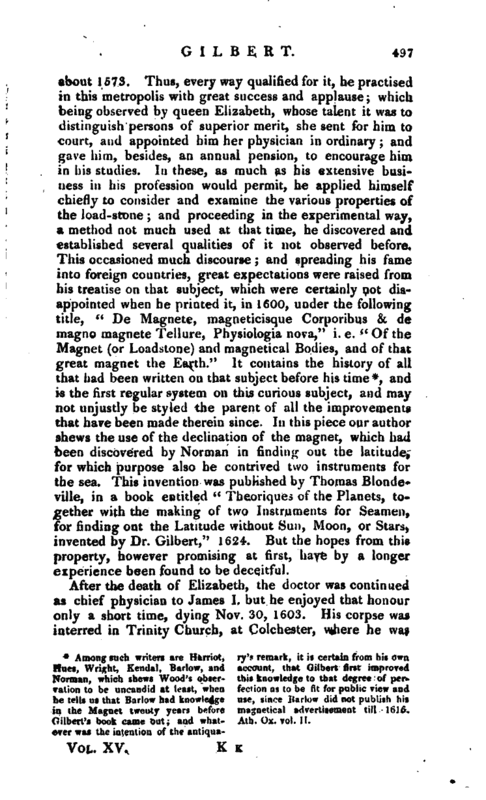 “Of the Magnet (or Loadstone) and magnetical Bodies, and of that great magnet the Earth.” It contains the history of all that had been written on that subject before his time*, and is the first regular system on this curious subject, and may not unjustly be styled the parent of all the improvements that have been made therein since. In this piece our author shews the use of the declination of the magnet, which had been discovered by Norman in finding out the latitude, for which purpose also he contrived two instruments for the sea. This invention was published by Thomas Blondeville, in a book entitled “Theoriques of the Planets, together with the making of two Instruments for Seamen, For finding out the Latitude without Sun, Moon, or Stars, invented by Dr. Gilbert,” 1624. But the hopes from this property, however promising at first, have by a longer experience beeo found to be deceitful. 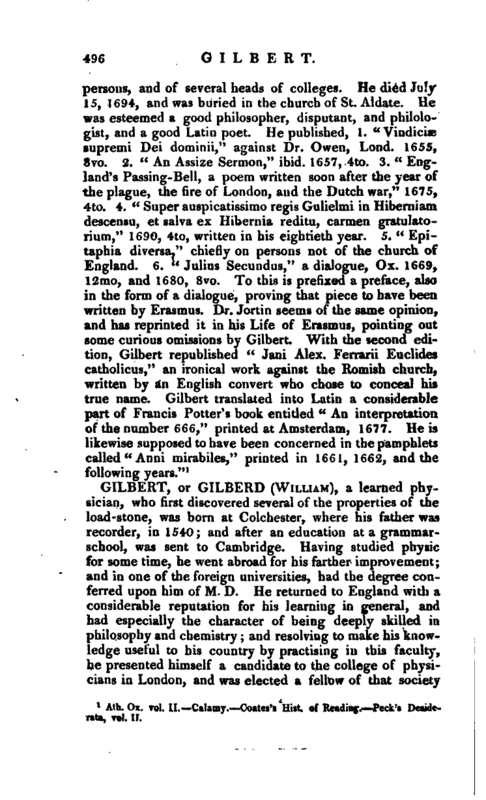 Among such writers are Harriot, Hues, Wright, Kendal, Barlow, and Norman, which shews Wood’s observation to be uncandid at least, when he tells us that Barlow had knowledge in the Magnet twenty years before Gilbert’s book came out; and whatever was the intention of the antiqua ry’s remark, it is certain from his own account, that Gilbert first improved this knowledge to that degree of perfection as to be fit for public view and use, since Barlow did not publish hit magnetical advertisement till 1616. —Ath. Ox. vol. II. | burn, and where there is a handsome monument raised to his memory a print of which is to be seen in Morant’s “History and Antiquities of Colchester.” By a picture of him in the school-gallery of Oxford, he appears to have been tall of stature, and of a chearful countenance. His character stood very high with the philosophers of his age and country. Carpenter tells, us, that he had trodden oat a new path to philosophy. 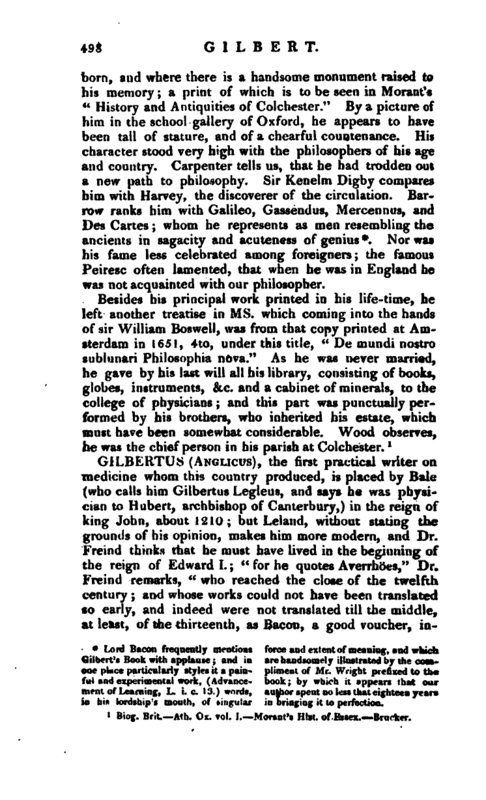 Sir Kenelm Digby compares him with Harvey, the discoverer of the circulation. Barrow ranks him with Galileo, Gassendus, Mercennus, and Des Cartes; whom he represents as men resembling the ancients in sagacity and acuteness of genius *. Nor was his fame less celebrated among foreigners; the famous Peiresc often lamented, that when he was in England he was not acquainted with our philosopher. Biog. Brit. —Ath. Ox. vol. f. Moranf s Hist, of Essex. Brucker.